Emma: Skiing like a Big Girl at 2-1/2! Emma's mom sent in these comments about their test of Kid-Ski Products: The Tip Lock, the Kiddie-Lift, the Ski Leash. the Ski Bar, and a video with teaching tips. The products were tested at North Lake Tahoe ski resorts Alpine Meadows and Sugar Bowl, California. They were also tested in Mammoth Mountain (central California) and in Vail, Colordao. Emma is two and a half. Functionality: These products are very well-thought out and very well-made. We had tried another system for Emma earlier this year and there was no comparison - it just wasn't any fun. With the Kid-Ski products all of us were able to relax and have more fun. 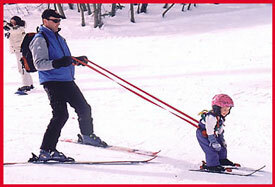 The Ski Leash had a double-leash system (attached to both hips via a waist band), which was key. With an attachment to each hips, we were able to "steer" her down the hill and even teach her how to turn from side to side. The pouch in front was a very handy feature - it was nice to tuck the leash away when standing in line or getting on and off lifts. The Kiddie-Lift (harness) made loading and unloading the chairlifts a cinch. You don't even have to bend down to lift her up. Also, when she did fall, lifting her by the handle on the back was a most welcome back-saver. We used the Kiddie-Lift for ice skating too! The Tip-Lock was good too although we found we used it only occasionally. Emma seemed to be able to get along just fine without it so we weren't sure if we really needed it. Sometimes her tips would actually get caught up in a clump of snow and throw her off balance, so we found in conditions like this it was easier for Emma if we unclipped the Tip Lock. However, this was very easy to do depending on the conditions (it's not a permanent tip-locking system). In my opinion, one of the things that makes this whole system so superior is that Emma is able to stand up and ski all under her own power. We weren't holding her up or carrying her, so she was able to get the sensation of skiing "like a big girl" - all by herself. I think it was good for her to get a sense of balance as well. How is it made: These products are extremely well made, and though we only have used for one season, I have no doubt that it will last over many seasons of use. Use: We used the products skiing at Resorts (no slope to my back yard!). Several people noticed the whole system and commented on how clever it was and many people with young children asked us what brand we were using. Cool factor: Emma was most definitely the coolest kid on the mountain. (ed. note: this comment comes from a biased mom: me!) Bright colors and ease of use had her flyin' down the slopes. I would most definitely buy one as we found we couldn't live without it. To buy any of these Kid-Ski products, go to our KidzStore here.